Today's card from the Spring Blogger's Swap is from the talented Terri Digness. 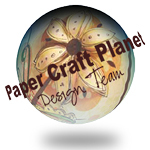 Terri's blog can be found over at: Stampin' With Terri. Terri's blog is a fun collection of cards, gift ideas, scrapbook layouts, some family stories and a whole bunch of creativity! 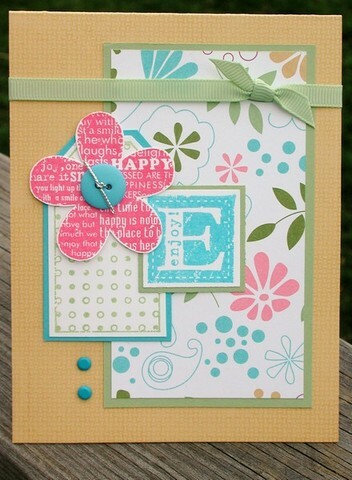 Terri created this card with some really fun colors, embellishments and stamps. Such a fun spring-themed card! Thank you, Terri for sharing your creativity with all of us! What an amazing design! Terri has little photo albums on her side bar that you can click on to view her awesome projects! Blogger's Swap.....First Artist - Me! That fearless Blogger's Swap coordinator, Sarah Moore, was at it again for us! She coordinated a spring time Blogger's Swap and I just got mine back (6 cards total) and they're all amazing! I LOVED what everyone made! I'll be sharing those cards over the next few weeks, so be sure to check back. For the first card in this swap, I'll start with myself. Wanna hear a funny story?? I've been SO busy lately with deadlines, work, being here, being there, volunteering at my kids' school, school vacation, having my sister's kids here for 4 days, getting my Tutorial Program and some other fun stuff off the ground and so much more. I did my swap cards and sent them off to Sarah and kind of forgot about them because I was so involved in other things. Sarah then announced that they were on their way to all the bloggers that took part and for the life of me, I couldn't remember what I did for the swap! I sat there and wracked my brain and STILL couldn't remember what I made. I just figured that it would be a huge surprise to me when I got my swaps back. Not only would all the other cards from the other bloggers be a surprise to me, but my OWN card would also be a surprise because I couldn't remember what I made! So.......for this card, I used the Doodle This set, which is in the Spring Mini Catalog. I ADORE this set! SO much fun! I stamped the background with one of the flourishes from this set on the Cool Caribbean cardstock with the same color of ink. I just LOVE tone on tone backgrounds. 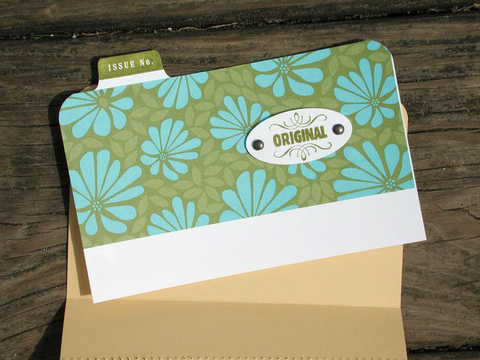 I then stamped the big flower from this set onto Marigold Morning cardstock with VersaMark ink. I then sprinkled it with Crystal Clear Embossing Powder and heated it with my embossing gun. I mounted this on top of a piece of Certainly Celery cardstock and then on another piece of Regal Rose cardstock. I then wrapped a piece of Black gingham ribbon around these three cardstock and adhered it to the backside. I then mounted all of this to my Cool Caribbean card. For the big flower embellishment, I used the Emboss Resist technique. I stamped the big flower on a piece of Almost Amethyst cardstock with VersaMark ink, then embossed it with Crystal Clear embossing powder. Because I used clear powder, it "preserved" the Almost Amethyst color underneath. I then used a stamping sponge to sponge Lavender Lace ink over the top of the embossed image. Because the amethyst cardstock was preserved underneath, the color showed through when I sponged the darker ink over the top. It almost makes it look like I used a color embossing powder. I cut the flower out using my Paper Snips scissors and mounted this on the Marigold Morning strip with Stampin' Dimensionals to give it a little more dimension. To finish the card off, I stamped the word, "thanks," (from the Much Appreciated set) with Basic Black ink at the bottom of the card. Hope you all have a wonderful weekend full of your own happy surprises! Last, but certainly not least, are the two final swaps in the Blogger's Valentine's Swap. The first card is from Terri Digness. When I pulled this card out of the swap envelope, I literally gasped! The amount of dimension and detail that Terri put into this card astounded me! What an amazingly creative artist she is! 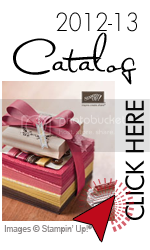 This card is full of embossing, faux stitching, chipboard embellishments, ribbon, cord, microbeads and the list goes on. This card is an unbelievable TRUE piece of art! Terri has a spunky sense of style that I find very refreshing. She comes up with creative ideas and great color combos. 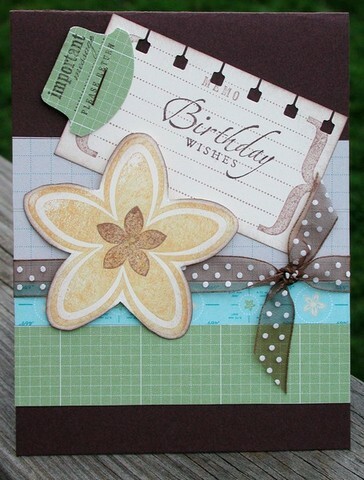 Make sure you check out her blog, Stampin' Terri. Thank you, Terri, for such a special treasure! 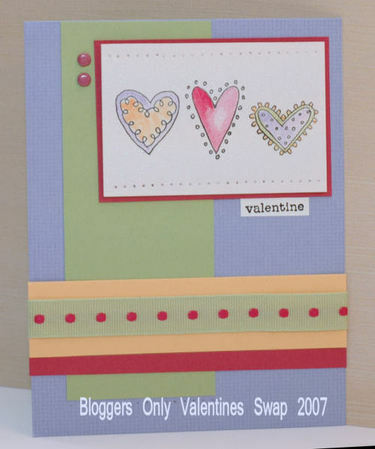 The last card of the Blogger's Swap is from the organizer of the swap: Sarah Moore! Sarah truly is a STAMPSTAR! She organized this wonderful swap, swapped all the cards out, mailed them all back.....she's an awesome stamper, organizer and blogger! THANK YOU SARAH! Sarah's card is absolutely adorable! She used one of the Pocket Notes cards in the Winter Mini Catalog. She also used her Cuttlebug folder to emboss the front of the card. Sarah turned her little card into a mini book/card. I love that she used so many cool things on her card. Metal edge tag, embossing folder, die cut letters, cord.....she even stamped a faux seal on her envelope! The inside of the card is a hoot! I love Sarah's sense of humor! 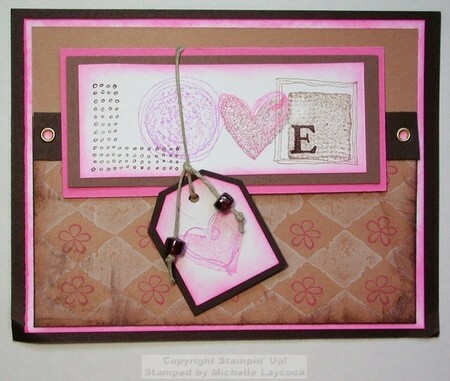 Sarah's blog, Sarah and the Stampstars, is full of all kinds of crafts. She shows her stamped art, as well as beaded art and other projects. Sarah's humor shines through in her writing and it's always a fun jaunt through her blog. She'll be organizing another swap in the spring for bloggers.......and as a tease, you'll be seeing another piece of Sarah's art here on my blog in a few weeks or so. She created something really special for all of you, so be on the lookout! Thank you, Sarah, for the wonderful job you did in putting this swap together and for the adorable card! 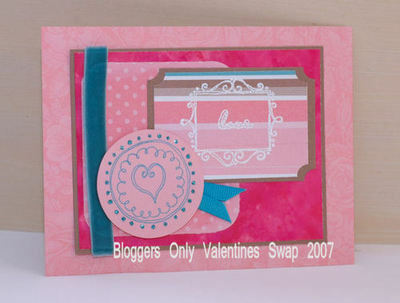 I have another two beautiful cards to share with you from the Valentine's Blogger's Swap. Also wanted to give you a heads up that tomorrow I'll be sharing some of my own art. I had a class Tuesday night and want to share some of the really cute projects we made. I've also updated my SunshineMama blog. One of today's artists is Colleen Laux. 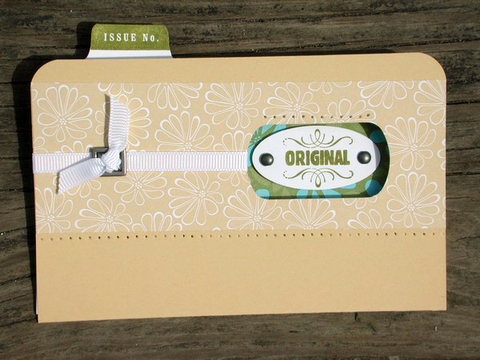 Colleen used one of our adorable little Pocket Notes that we have in the Winter Mini Catalog right now. These cards are absolutely precious and I just got a pack of these in the mail and am SO glad I went for it because when I saw her card, I fell in love! Colleen has a lot of dimension and texture on this little card. These cards may be little but they sure pack a lot of punch! You really CAN create an amazing work of art on such a small piece of cardstock. Colleen's card is definite proof of that. Colleen has included ribbons, distressing the edges of her pink cardstock, patterned paper from the ever-lovable Loves Me paper pack (ONLY available through the end of Feb., I might add!) and dimension by mounting the mug with pop-dots (aka: Stampin' Dimensionals) and even mounted the heart on top of the mug with another pop-dot! So cute! She stamped inside the card with Whisper White craft ink and she even stamped the envelope to match the card!!! Thanks, Colleen for a super cute and easy design! 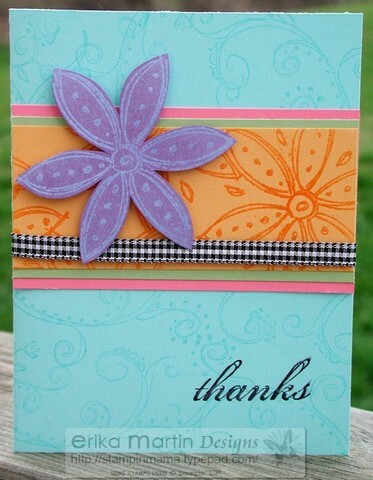 Colleen's blog, StampinGoddess, is full of fun cards like this. She really is a Stampin' Goddess! Make sure you check her out and see what's she's all about. The second artist for today is AnneMarie Zimmerer. AnneMarie created a really sweet Valentine's card! It's hard to tell from the picture, but what's really great about this card is that she used the masking technique to stamp the cupid over the word stamp (which is in the shape of a heart) then stamped a second cupid, colored him in with her Prismacolor pencils and Gamsol and then cut him out and mounted him on top of the first cupid to add some extra dimension. What a wonderful use of two different techniques! And ribbons adhered with staples will make me swoon every time! The cupid even has glitter on his wings! Now, how cute is THAT? Thanks, AnneMarie, for a LOVELY Valentine's card! AnneMarie's blog, One More Thing, is a collection of card and scrapbook designs, stories about her family, recipes and more. 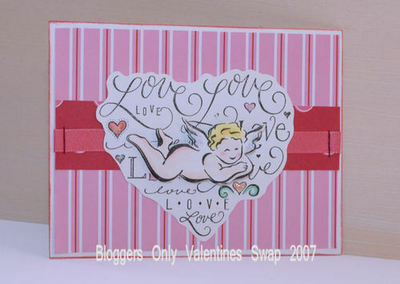 I have three swaps to show you today from the Valentine's Blogger Swap. These would have been up last night, except that my DSL connection kept getting bumped off every time I visited a few different websites. Bummer because they were stamping related and now I won't be able to visit them until I can trust that I won't have to reboot my computer every time I go to them. The first card is from Alora Sweetser. This card really was the first one that I pulled out of the bag when my swaps arrived and I just GASPED! I loved the colors she used! This card has such a mellow and pleasing combination of colors Alora's watercoloring expertise really shines through on this card. You can't really tell from the picture, but she used Stampin' Up's Shimmery White cardstock for the watercoloring. It has such a pretty glint to it. Absolutely gorgeous. I love Alora's style. She has such a definite style.....you can tell by looking at the cards on her blog that she has a clean, graphic look to her cards. Everything is perfectly dimensioned and placed in just the right spot. She has such a wonderful eye for color and placement. Just looking at Alora's cards gets the creative juices flowing for me. Thank you, Alora, for a beautiful masterpiece! This next card is from Amanda Sewell. This card packs a lot of sweet punch! What struck me about Amanda's card are the bold colors and patterns. I really like the stark contrast between the black and the soft pink. And those lips! How adorable! Amanda's card features "Faux stitching," which I think is the best invention since Q-tips! Amanda's blog, Inspirations, has a unique blend of whimsical designs, family stories and even recipes on her blog. If you're looking for some fun ideas to add a little whimsy to your cards, go through Amanda's blogs and past entries to see some really cute cards and projects. You're sure to be inspired. Thanks, Amanda, for a super creation! Paper: Regal Rose, Whisper White, Basic Black, Diecuts With a View - Valentines Words 12x12. Accessories: Black grosgrain, Black gelly-roll pen, paper piercing tool, ruler. The last card for today is from Lynn Mercurio. 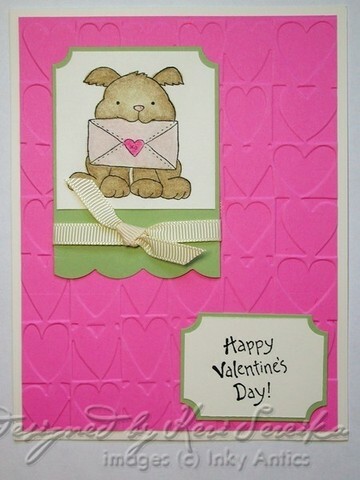 Lynn's blog, Stamperosity, has a lot of wonderful designs and ideas for your cards, gift ideas and color combinations. Through looking over Lynn's blog, she has the best use of pink that I've ever seen. No matter what shade of pink, Lynn can pull it off! Thank you, Lynn, for a simply DELICIOUS card! Today I'm going to share two pieces of art from the Valentine's Blogger's Swap. The first artist is Denise Foxworthy . Denise created this adorable card, which showcases lots of dimension and some really ingenious accents. First, I love the felt heart. What a cute touch! I also love that she added a straight pin into it, along with the black gingham ribbon that's tied onto it. The other accent that I love is the little heart shaped brad on the greeting. 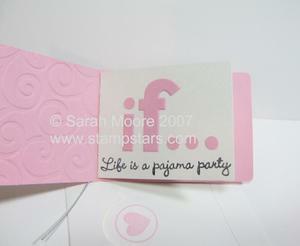 And of course, that beautiful embossing done with the Swirls Cuttlebug Embossing Folder. That swirl pattern is my favorite. 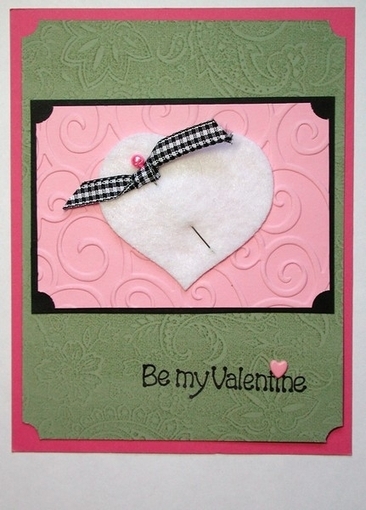 Make sure that you stop on over to Denise's blog: Sentiments by Denise to see her other creations. Thank you for the beautiful creation, Denise! My next artist is Michelle Laycock. I was never really a pink fan, but ever since the fashion trends started leaning towards pairing pink with brown, I fell in love. I love that this card uses both of those colors together. And that little hanging tag is just darling! Michelle created a card with lots of extras to look at, but they're all well balanced and not at all overwhelming. Michelle's blog can be found at: InkArtist Head on over for a look.....there's quite a lot to look at. Michelle's been blogging since 2003! My third artist from the Blogger's Swap is Keri Sereika. Keri and I are are actually on GinaK's Design Team together for GinaK's line of rubber stamps. I really enjoy Keri's style and the color choices she comes up with are always something I look forward to. She has a really clean and crisp style to her art that is so refreshing to look at. I always enjoy getting her blog updates in my inbox. 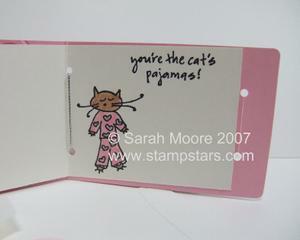 This card is one that Keri did with her Inky Antics stamps. Keri is also on the Inky Antics Design Team.....she's simply amazing! And unless you've been hiding in your craft room for a while now, you'll notice that Keri also used one of the NEW Cuttlebug Embossing Folders on her card. This effect is ALL THE RAGE and absolutely adorable. Thank you, Keri, for such a CUTE card! For the next card in the Blogger's Swap, I'm going to show you mine! This is the card that I did for the swap. I had so much fun doing this one and love how the Sahara Sand cardstock and ink really worked well with the Cameo Coral. For this card, I used the Double Resist Technique. You can go to THIS POST for a step-by-step tutorial to learn how to create this effect. 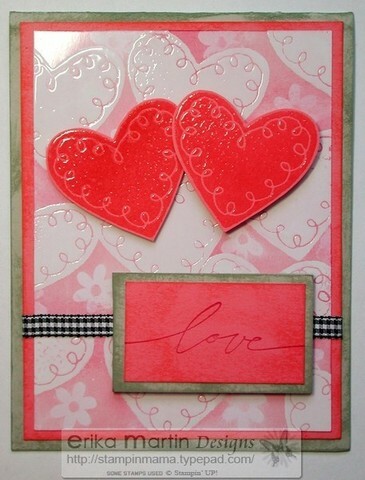 For this card, I used the Loving Hearts set to do my images (the large heart and the small flower image). I used Cameo Coral and Rose Red for the inks that were sponged on the glossy white cardstock. I swiped my Sahara Sand cardbase with Sahara Sand ink (see THIS POST to see the question I answered as to how to swipe). I also swiped my Cameo Coral layer that was put on top of the Sahara Sand. I used a rectangle piece of chipboard (from Bazzill Chips) and covered it with swiped Sahara Sand cardstock, then layered it with a swiped piece of Cameo Coral that had been stamped with the word, love" (from the Wonderful Words set), with Rose Red ink. I wrapped a piece of Black gingham ribbon around my glossy white cardstock, which was mounted on top of the Cameo Coral cardstock and adhered it on the back. I mounted the chipboard accent on top of the ribbon using Glue Dots. For the heart accents, I stamped the heart image from the Loving Hearts set on Cameo Coral cardstock using Versamark ink, then sprinkled Crystal Clear Embossing powder on the images, shook off the excess, then heated the images with my Embossing gun. I cut them out using my Paper Snips (I LOVE those scissors....they're really great for precision cutting), then mounted the hearts on my card using Stampin' Dimensionals. For the heart on the right, I used two layers of Stampin' Dimensionals stacked on top of each other to give that heart a little more height over the heart on the left.